Set sail to Ireland for a fantastic price. With crossings available from both Holyhead and Pembroke, you can experience the Irish life for less this year. Great discounts for Kids, Foot Passenger Minicruises, Motorist Minicruises and Walk on Fares when you book now. Get 3 times the value of your Tesco Clubcard points when you use them to pay for your ferry trip. Where do I use my Irish Ferries voucher code? Select an Irish Ferries code of your choice at NetVoucherCodes.co.uk. Copy the code and go to irishferries.co.uk using our link. Enter your trip details and at the bottom tick, the ‘with Promotion code’ box then enter your promo code. You will now have a selection of travel times and prices, select which is most convenient before clicking continue. Select your additional extras and click ‘Continue’ to register your personal details or log in to your account and complete the payment. "As a rule, the earlier you book, the cheaper the fares, especially for peak season crossings." Cross the Irish Sea with comfort and speed aboard a top-of-the-range ship operated by the Irish Ferries company. With three ferries operating between Britain and Ireland and a host of awards under their belt, Irish Ferries pride themselves on providing a delightful experience for all their passengers, whether it’s families, couples, or individuals. With Irish Ferries, you can choose from pre-made packages that include holidays and hotel stays, or just simple passage bookings from Ireland to your location. Whichever you choose, affordable prices and deals are always guaranteed with our range of voucher codes and cost cutting offers. Travel from Holyhead to Dublin with Irish Ferries. Holyhead is situated in Anglesey in North Wales and is served by the A55 and A5 road networks. Holyhead is in close proximity to various popular locations throughout Britain by car, including Chester, Liverpool, Manchester, and Birmingham. Holyhead also has an excellent rail service providing connections to rail stations throughout Britain, making it an easy port to access. Once you arrive at the Holyhead Port you can enjoy an easy 30-minute check in and choose from up to six sailings a day so you can either speed across the Irish Sea or cruise along at your own leisure. The "Jonathan Swift" is the Fast Ferry that’ll carry you on the Holyhead to Dublin Port route. With a journey time lasting as little as 1 hour 49 minutes, the “Jonathan Swift” is a modern well-equipped vessel designed to get you swiftly and safely across the Irish Sea. Irish Ferries offer a selection of impressive ships traveling from Ireland to Britain, Ireland to France, Britain to Ireland and France to Ireland, so whichever route you travel by, you can be sure of some great on board facilities. While traveling with Irish Ferries you can not only enjoy great ships but also affordable holidays and hotels too. Discover excellent deals with Irish Ferries choice of hand picked hotels, cottages and B&B's all over Ireland. All their prices include a return cruise ferry as well as expert advice to help plan your ideal holiday in the country they know best! Ireland has so much to offer travelers and is so close to home, there really is no need to travel further afield for a relaxing break. Each holiday with Irish Ferries allows you to discover beautiful counties- one of these countries is Cork- a dream destination in the South West of Ireland. This hidden gem is filled with coves, beautiful scenery and sandy beaches, as well as bustling city streets offering unique shops, bars, and restaurants. The surrounding areas also offer plenty to explore, with horse riding on undisturbed Irish beaches, walks on the hills in Mizen Head which give way to breathtaking sights of the glimmering blue valley beneath, and even trips to local farmers markets for an authentic Irish experience. If you want to visit Ireland choose Irish Ferries - a company that knows all the ins and out of Ireland and that can offer you the very best when it comes to prices. For additional savings and discounts check out our voucher codes and offers above and head to Ireland for a trip of a lifetime. The Dublin Swift vessel is the fastest in the Irish Ferries fleet, completing your journey across the Irish sea in as little as 1 hour and 49 minutes. On board, you will find plenty to keep both kids and adults entertained for the duration of the journey. The Dublin Swift comes complete with dining facilities, a great range of shops and wifi in designated areas, making your journey more enjoyable and fun! Club Class is also available which offers reserved seating, priority boarding, complimentary drinks, snacks, and newspapers, as well as exclusive access to the lounge bar. As a club class passenger, you will also receive a 10% discount on your onboard shopping. The Swift ship at Irish Ferries travels from Holyhead to Dublin and back again and is ideal for those passengers that want to speed across the Irish Sea to reach their destination sooner. For all the latest and upcoming deals available for the Dublin Swift route make sure you check out our Irish Ferries deals page or sign up to the Netvouchercodes newsletter for the first glimpse of new exclusives and money saving codes. Choose Rail and Sail with Irish Ferries and travel to Ireland for just £34 each way. Book a train with Trainline UK, Irish Ferries’ trusted partners, and enjoy rail connections from 2,400 stations in Britain. Travel from your location by a modern, comfortable train, then, sail directly to Dublin: 1 hour and 49 minutes by Fast Ferry, Dublin Swift or 3 hours and 15 minutes on the cruise ferry Ulysses. With Rail and Sail, there are no taxes or airport hassles and you get great value all inclusive fares for both rail and sea. 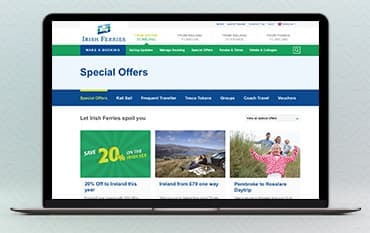 Visit the RailSail page on the Irish Ferries website and enjoy an easy, value for money way of traveling. For extra savings use our voucher codes and deals to cut the cost of your ticket further. It is recommended that when on board, you bring a passport with you. Irish and British citizens are not required to bring a passport on board when travelling between to two countries however some form of identification is necessary. Any nationality excepts Irish and British require a passport to travel. Any Non-EU nationals should check with the British Embassy before travelling as they may require a visa. Passengers who arrive at ports without the appropriate documentation may not be allowed in either British or Ireland. All prices on Irish Ferries are in Euro. However, you can make payments in either Euro or Sterling. Currency exchange rate apple for payments by sterling. Bureau de Change facilities are available on all 3 of the Irish Ferries travelling between Britain and Ireland. Routes travelling from Ireland and France will only accept euro as a payment. Irish Ferries allows you to cancel your booking, however, charges will incur. All cancellations should be in writing and you should notify bookings@irishferries.com immediately. Find charges for cancellations on all routes here. If you need to find a ferry route from the UK or France to Ireland then look no further than Irish Ferries. With daily routes from Holyhead, Pembroke, Roscoff and Cherbourg to either Dublin or Rosslare you can easily find a route and sailing time that best fits your travel schedule. Also offering Holidays and Breaks Irish Ferries can provide you with a hotel or accommodation for the duration of your trip, with prices to suit every budget. Before you book a trip with Irish Ferries be sure to visit our Irish Ferries page and cut the cost of your overall spend with one of our money saving Irish Ferries discount codes or deals. We are constantly on the hunt for Discount Codes for Irish Ferries to help you with your money saving. Our experts check dozens of sites for secret codes including NHS discounts, student sites & social media channels saving you time & money!